An annual event that's great fun to experience! 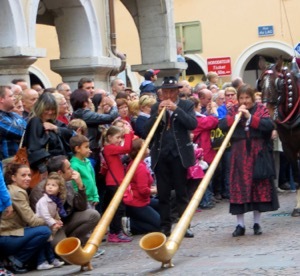 If you happen to be in Annecy the second Saturday of October, be sure to take in the Retour des Alpages. This festival celebrates the time when the animals return from the summer grazing. It's a wonderful display of Savoyard traditions. 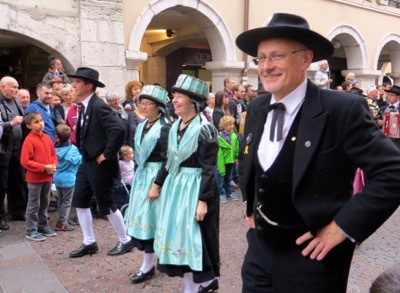 You'll find a variety of musical groups—accordion orchestras, yodelers, mountain long horns, and more. People dressed in traditional costumes will play and sing throughout the day. Most of the action is around the Place Notre-Dame and the Rue Ste-Claire, in Old Annecy. And the food! You can enjoy some tartiflette (potatoes, cheese, onions, and bacon) or a diot (Savoyard sausage) sandwich, washed down with hot wine or fresh pressed apple juice. For dessert try some bugne, freshly made, fried, and sugared on the spot by a crew of cheerful women and men. There are also plenty of booths selling local cheeses and other products, fresh from the farm. In the afternoon the défilé, or parade, begins and ends on the Rue Ste-Claire, passing by the Place Notre-Dame and around the town. It's a great chance to see and hear all the musical groups, but it's much more than that! "Floats" of farm wagons pulled by horses, dogs, or people line the route, and dancers in colorful costumes sashay through the streets. Dancers in colorful costumes take part in the parade. Musicians play, including the alpine horn players—very impressive to see them carrying the instruments and even more so to hear them playing! 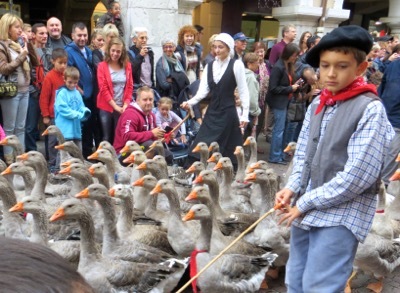 A young boy guides his geese in the parade, to the delight of onlookers. But the real stars of the parade are the animals—goats, sheep, geese, many large dogs, horses, donkeys, and at the end A LOT of cows, some adorned with flowers. It's a true celebration of the traditional Savoyard farm life, and we felt lucky to be able to experience it. This festival was started (or renewed) in the 1970s and is an annual event in Annecy. Above, Alpine horn players delight the crowd. They carry those large horns for the entire parade! 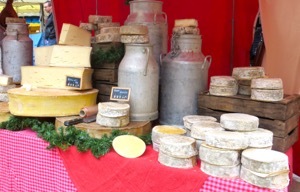 Below, Delicious Savoyard cheeses for sale during the Retour des Alpages. 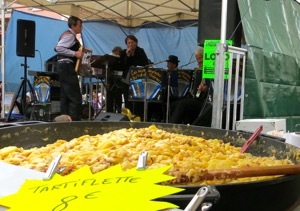 Above, A large vat of tartiflette ready to be served, while an accordion band warms up nearby.